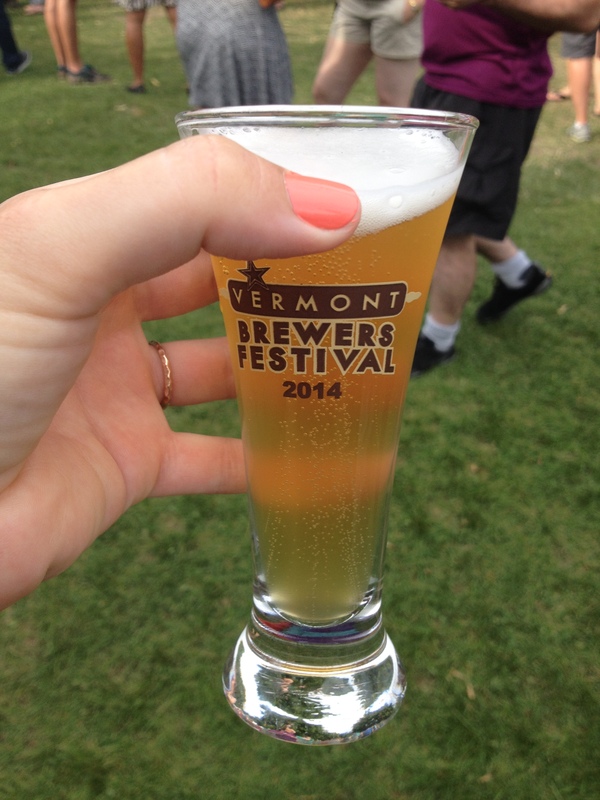 The Vermont Brewers Festival is an annual event, and every year, tickets sell out fast. This year, tickets sold out in a record 11 minutes! I’m lucky enough to sit at a desk all day long, so I was able to score tickets to the Saturday evening session for me and Ben. This is the first year either of us have been able to attend, so we were very excited. For the price of $30, you get a commemorative 5 oz sampling glass, and 15 sample tickets, which means you can try up to 15 beers. Most beer samples were only one ticket, but some of the higher alcohol content beers were two tickets each. You could also purchase additional beer tickets if 15 samples wasn’t enough for you. The event takes place in the Waterfront Park, which affords beautiful lake views and an awesome sunset for the evening session. With almost 50 breweries in attendance, as well as lots of food vendors, a good time was had by all. I’m gonna be 100% honest here and state that I couldn’t remember 90% of the samples I tried without a little help. 15 samples times 5 oz each equals just over 6 beers (our buddy Pete also gave me one of his tickets, so that’s even more! ), which is quite enough to get me feeling good. I actually went to the Brewers Festival website to try and jog my memory. Burlington Beer Company: Margarita Gose. Like Budlight lime, but way better. Fruity and refreshing without being artificially sweet. Drop In Brewing Company: Supernova IPA. Hoppy and delightful. Foley Brothers: Forgotten Ale. Surprisingly good for a sour beer. Harpoon: IPA. I was sad, because I asked to try their special Citra, but the guy misheard me and gave me the regular IPA instead 😦 I’ve had it many times, and it’s good, but I wanted the limited edition sample. Prohibition Pig: Pro Pig Extra Pale Ale. Pretty standard pale ale, nothing special. Queen City Brewery: Yorkshire Porter. Yum. I love dark beers. Stone Corral: Palomino Pale Ale. Again, pretty standard pale ale, nothing special. Sixpoint: The Crisp. Hoppy lager. More like a pale ale than a lager. Whetstone Station: Fort Dummer Summer Ale. Light and yummy. So yeah, that’s only 10 out of the 16 that I can remember trying. And really, after 5 or so samples, everything starts to taste the same, especially if you’re drinking hoppy or strong beers. There were a few breweries that I would have liked to hit, but the lines were insane; like, stretching from one end of brew fest to the other insane. This was the line for Lawson’s–you can see it stretches all the way back past that tree in the left corner! Lawson’s Finest Liquids and Hill Farmstead are two that (in my humble opinion) aren’t that amazing/aren’t doing anything super different from other breweries, but a) they’ve perfected the art of supply and demand (you can’t get a lot of it, it’s not available a lot of places), and b) recently got written up in some publications as really good beer, so people are flocking to them. There was plenty of delicious beer at plenty of other breweries, and I didn’t have to wait in line for an hour to try them. The atmosphere at this Brewers Festival was WAY different and more relaxed than the one we go to in Providence , RI every year. First of all, being outside, while a crap-shoot if the weather is bad, was amazing. It was a bit overcast, so it wasn’t blazing hot, and there was a nice breeze. It wasn’t at all claustrophobic, and actually had a festival feel, unlike being locked inside a convention center. The food vendors were totally overpriced, but it’s nice that they were there in case people needed food to be ok, whereas in RI, there was a limited amount of free pizza, and that was it. The commemorative glasses that they gave out are really nice, and I know we’ll use them around the house; RI had crappy plastic dixie cups. 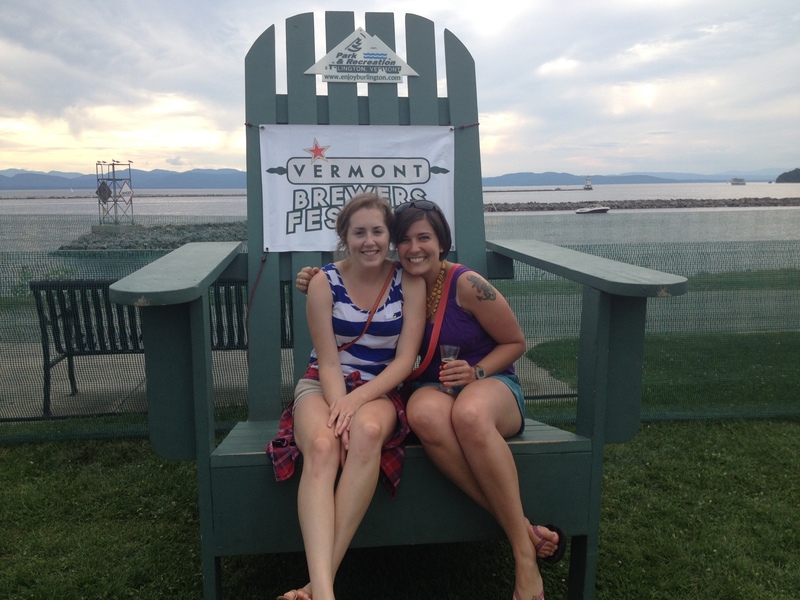 While the RI brew fest had unlimited samples, I was totally cool with the 15 tickets in VT. It made me more mindful of how many samples I was getting, and I was a lot more selective about what I tried. And we still left feeling pretty buzzed. 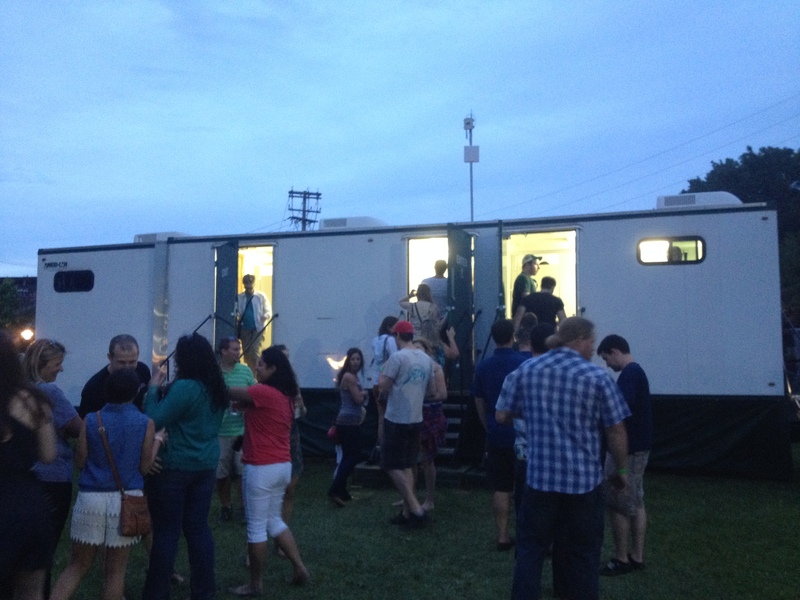 There were plenty of port-a-potties, and even some nice bathroom trailers, with flush toilets and running water, so the waits weren’t too bad. Yup, I took a picture of the potty trailer. For the price, the Vermont Brewers Festival is an excellent value, and I hope that we’ll be able to get tickets every year. 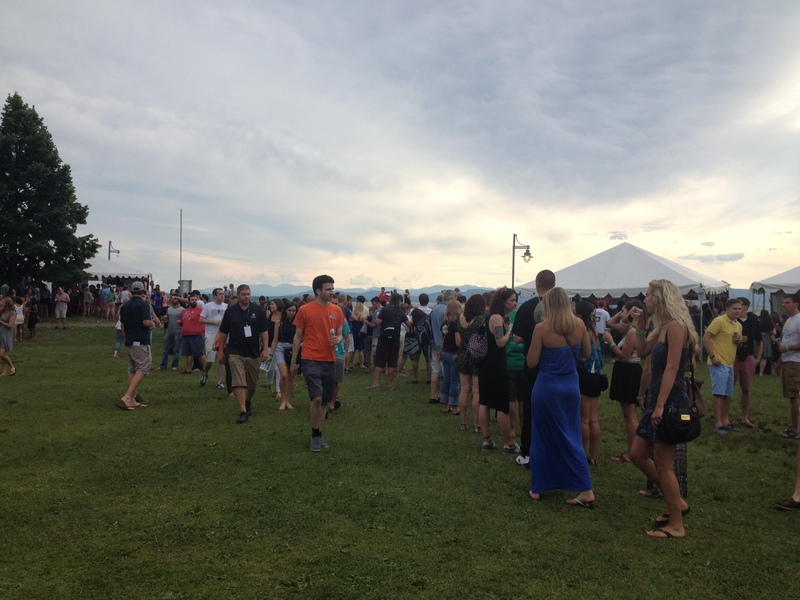 Did you make it to the VT Brewers Festival? Is there a Brew Fest that happens near you? Uh, you and Torry are looking a little..well…um…small???? Hehe that’s what the beer did to us! Because we are in wine country (Finger Lakes), they have a number of wine-based events … aside from the Wineglass Marathon, where you get a wine glass, half-bottle of wine and the medal is hand-crafted glass (because… Corning Glassworks). I haven’t done a lot of wine tasting, but I’d like to! And the Wineglass Marathon sounds awesome! Who doesn’t want a bottle of wine after a tough race? I think my favorite beer is one that I haven’t had in years and I don’t think it gets made anymore, which makes me a sad panda. Wormtown coconut porter… oh my yum. It was amazing. They do a chocolate coconut stout now called Norm that’s okay, but just not the same. Coconut porter, eh? Sounds intriguing. I’m not sure I’d like it, but I’d definitely give it a try! I am more of a wine fest girl than a beer fest girl, but this looks like so much fun! I love trying new things. 🙂 My husband brought home a vanilla porter recently and I really liked having a sip of that, but I don’t think I could drink a whole bottle. Thanks! Instead of a t-shirt they give you a pint glass! Should be a lot of fun! We had so many brew fests and stuff in VA and here in Chicago, and I would love to go to one, but Alex is always busy (stupid doctor). I’m not a big IPA person (I don’t do hops), but I am super intrigued by the Margarita Gose…. And those glasses are legit! I know, such a great souvenir! I am a Guinness girl. I also like Blue Moon–my favourite beer to get when I am Stateside as I can’t get it in Canada. Blue Moon has an agave summer beer that’s AWESOME. Have you ever tried it? Those things were awesome! More events need to have those. I want to go to this. Yes you do. It’s awesome! !